By all accounts, Israel’s Western Galilee region, close to the border with Lebanon, should be underdeveloped and poverty-stricken. Thanks to Stef Wertheimer and his innovative approach to industry, however, the area is awash in middle-class success. Well-kept single-family homes line the entrance to Ma’alot-Tarshiha from the main highway. Walkways in Ma’alot-Tarshiha—a municipality that serves the combined towns of Jewish Ma’alot (population 19,000) and Arab Tarshiha (population 4,000)—are framed by small parks decorated with fountains. Statues created for the annual sculpture festival grace street corners and sidewalks. Ma’alot-Tarshiha, in Israel’s northern periphery and a short drive west of the Mediterranean coast, bears no visible scars from the 2006 Second Lebanon War—Hezbollah gunners concentrated their rocket fire on larger targets such as Nahariya, Kiryat Shemona, Safed and Haifa. Instead, Ma’alot-Tarshiha’s renown comes from a 1974 terror attack that resulted in the deaths of 26 hostages and the wounding of 60 others. It also has a reputation as a development town populated by North African immigrants engaged in a losing struggle against poverty. A few miles to the south in the rolling hills of the Western Galilee is the Tefen Industrial Park, founded by industrialist Stef Wertheimer; it is a cooperative incubator for new businesses, the home of much of the local industry and the foundation of the area’s well-being. The Iscar plant and the industrial parks Wertheimer has built near the border with Lebanon generate at least $2.5 billion in income each year, most of it in exports; according to some estimates, the area, which is home to only a few percent of the country’s total population, generates as much at 12 percent of its exports. And the jobless rate in Ma’alot-Tarshiha, for example, is 5.5 percent, compared to 7.9 percent nationally. Wertheimer’s reach extends beyond industry. On the road to Tefen is Kfar Vradim, the Rose Garden Village. Set up by Wertheimer, the upscale town is a model community with an array of services, a well-groomed place where even the municipal garbage dumpsters are hidden. It is home to many professionals and entrepreneurs who work at the local parks and attracts those who want to get away from the congestion of Ma’alot-Tarshiha—and can afford the high housing prices. An educational network that spans the entire region, also spearheaded by Wertheimer, offers mentoring for older entrepreneurs and post-high school and post-Army vocational training. “Many hundreds of people, both children and adults,” go through the schools each year, says Dan Sharon, who became head of Wertheimer’s educational services two decades ago. The network of roads—including a four-lane superhighway up to the hills from the coastal area and a much- needed link through the mountains to Karmiel in the south—is far superior to infrastructure in other areas of rural Israel, particularly those far from the center of the country. Any improvements not directly financed by Wertheimer can be attributed to the impact of the industrialization he has brought to the area. The developments of the last 20 years may only be the start. According to Wertheimer’s son Eitan, 53, who now runs the family empire, much of the money from the Iscar sale will be invested in the region. “There are a lot of empty mountaintops here,” he was quoted as saying in the Hebrew press, though he has said it is still too early to talk about plans for building in any particular area. Craggy and still sharp at 81, the elder Wertheimer now concentrates on making his vision of what he calls “the third stage of Zionism” come true. The first stage, he explains, was establishing agriculture, the second was building the military so Israel has the capacity to defend itself and the third is region-wide economic renewal and industrialization—making things the world needs. His long-term goal is to create an economic powerhouse that enriches the entire Middle East for Jews as well as Arabs. “If we don’t help our neighbors, we will create envy. 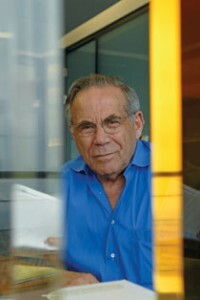 But if we show the Arabs how to be part of the world, to sell products in Japan and buy in America, the commerce and global thinking we create will be tools for people to work together,” says Wertheimer, who outlined his ideas for what he calls a “Middle East Marshall Plan” in a speech to the United States Congress in 2002. “People are dangerous when they have nothing to lose,” he says. To this end, he has established an industrial park at Gebze, Turkey; plans for similar parks in Jordan and near Rafiah on the Israeli-Palestinian Authority border have been sidetracked by politics. Born in kippenheim in Germany’s Black Forest, Wertheimer immigrated with his parents to British Mandate Palestine at the age of 11 and got into the business of precision tools almost accidentally. After serving in the Army and as a munitions worker in the 1948 War of Independence, he says, “[My wife and I] had a chicken farm in Nahariya and two small children, and I needed work. I tried to find something I could do at home.” He began making small tools for industrial machines on a grinding machine in his kitchen, delivering them to customers on his motorbike. “I used to drive around the country with my tools in a box,” he recalls. He founded Iscar in Nahariya in 1952 and set up Tefen in the early 1980s with the already successful Iscar plant as its flagship company. Over the years, Iscar has become a world leader in the production of carbide industrial-cutting tools. “Iscar would be an exceptional company anywhere, I have not seen anything like it in the United States,” said Warren Buffett during a 2006 visit to see his new investment. In deciding to purchase Iscar, he said his insurance and investment firm, Berkshire Hathaway, “was not measuring Iscar against some other Israeli company, we were measuring it against everything we see in the world.” It is not just fiscal success that makes Iscar stand out. Its offices at Tefen are airy and spacious. Employees enjoy a subsidized, waiter-served, three-course lunch for about $1 a person in the dining room at Tefen. As in other Iscar plants in North America and Korea, there is no special place for the executives, though Wertheimer does have a reserved table in the corner with the best view. That’s certainly true at Tefen, the prototype for all of Wertheimer’s parks, where low-lying buildings are clustered around a grassy quadrangle dotted with sculptures. A museum complex features Eitan Wertheimer’s collection of antique automobiles (he also owns a horse-breeding farm in the area). There are permanent exhibits on German Jewry and temporary displays shown in cooperation with prestigious institutions such as Tel Aviv’s Rubin Museum; thousands of people visit Tefen each year to enjoy the park’s cultural offerings. Iscar’s staff has both Israeli Arabs and Jews in senior positions, and Arab-owned companies rent space in all his parks (such as Gamila Healing Soaps, a tenant in Tefen). On Stef Wertheimer’s desk is a carved wooden eagle given to him a few days earlier by a grateful Druze village at the dedication of a local vocational school equipped entirely at his expense. Others have good reason to be grateful as well. One of Tefen’s purposes is to help develop businesses that manufacture for export. These start-ups are nurtured at the park, with business planning assistance and entrepreneurship-development programs readily available. Once a company is established, it is expected to move to a new location to make room for a new start-up. Oded Bashan, the founder of On Track Innovations, for example, was accepted into Tefen in 1990 to develop his ideas for an electronic purse. Over the years, OTI grew into a world leader in contactless smart cards. OTI, which has moved to its own headquarters at Mahanayim in the Upper Galilee, near the Tel-Hai Industrial Park, last year had revenues of $40.6 million and a client list that includes universities and hospitals, the Kenyan government, a leading Turkish bank and Citibank. Wertheimer’s other industrial parks are flourishing as well. Despite Tel-Hai’s location near Katyusha-hit Kiryat Shemona, the park is full to capacity, notes Debbie Simmons, deputy general manager of all of Wertheimer’s industrial parks. Tel-Hai’s tenants include a development center of the multinational BMC sofware house, a Tadiran Communications plant and facilities of Etrog Biotechnology. And the year-old Dalton Industrial Park, half an hour’s drive south of Tefen, “has brought industry and industrial employment to an area that till now was known mostly for tourism and the growing of wine grapes,” says Simmons. Ma’alot-Tarshiha, however, is thriving, though signs remain of the town’s less prosperous past. The aging-but-neat central shopping area includes a 1950s-style supermarket, a bank, several mom-and-pop stores selling household goods and a few coffee shops and eateries. The city plans to build a new high-end shopping area. At one end of a small lane, older men cluster around tables, playing dominoes. At the other end, Yaron, a 40-something of North African descent who owns two small clothing shops, takes a break from minding his stores and passes the time sitting on a bench. “If it wasn’t for Iscar and Stef Wertheimer, this place would be like Yeruham,” he says, invoking the name of the Negev’s most desolate development town. After years of open bickering, Wertheimer and Buhbut—who both contend the national government is controlled by and focused on the center of the country—now work together for increased government investment into the area, especially for better rail and road links to Tel Aviv and Jerusalem. Such an elevation, were it ever to come, would multiply Buhbut’s impact in the Western Galilee—an area that, until then, will remain indisputably Stef Country.